It’s hard to believe it’s been over two and a half years since I started to ramble my thoughts on this little Blog. As I get older I find myself writing more and coding less so I’m grateful to all my readers for their encouragement. I wanted to take today to say thanks and show you all how things are going. I especially owe a lot to the good folks at PC Pitstop who link to Bits from Bill in their newsletter as well as others who include links on their blogs or articles. This month in particular has been a good one. The Windows XP SP3 discussions were well read and commented on. 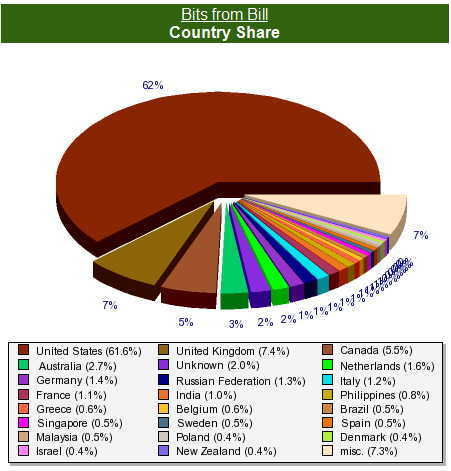 One of the things I’m most proud of is how many readers I have outside the US. It just goes to show how global our internet community is and how important it is to respect the views and opinions of everyone around the world. It looks like Windows XP remains popular and even though I’m a Windows guy I’m pleased I can provide topics of interest to both Linux and Mac users. I plan on continuing to keep writing and hope my audience will continue to grow. My wife Cindi still doesn’t understand why anyone would actually care what I think, so thank you all again. 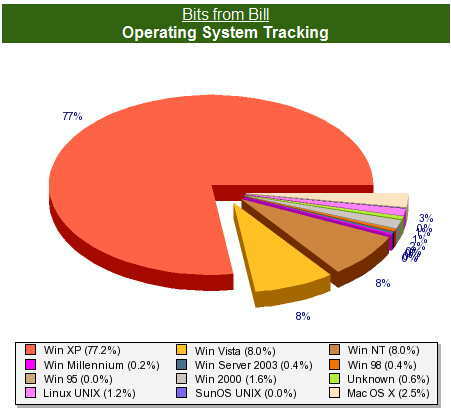 Bill, what tool is used to provide the statistics you have shown (pie charts, graphs, etc)? 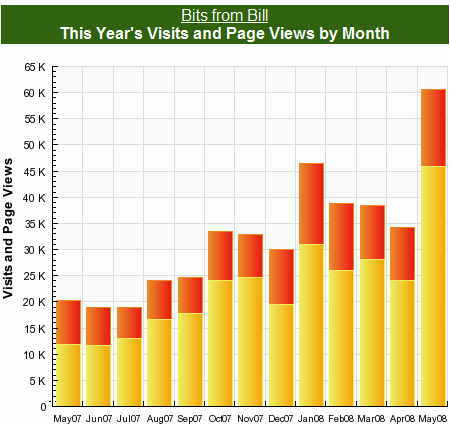 Are you using google's analytics? Thanks. On web sites that I own and control the domain I use something called Urchin. The graphs you see in this post are from SiteMeter. Recently, I've been playing with "Clicky" which I've included a link on the left side of my Blog. Both require a small monthly fee.